Bottle of Bass, Glass, and Newspaper, 1914; painted tin plate, sand, iron, wire, and paper. 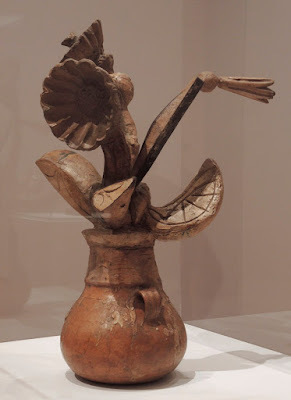 There's no question that Pablo Picasso was a sensualist, in his life and in his art, so it is not surprising that the painter worked in three dimensions throughout his life. 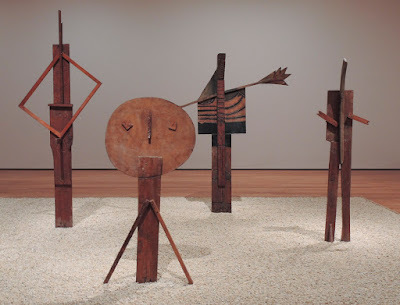 The current show, "Picasso Sculpture", at the Museum of Modern Art presents over 100 of his sculptural works, from very tiny to large; my sense was that Picasso enjoyed every minute of their making. 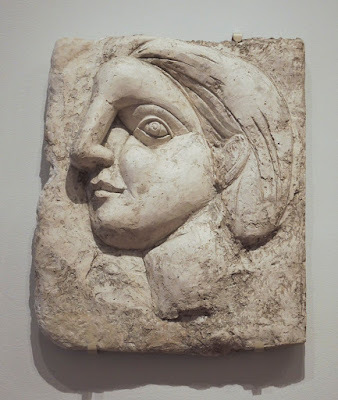 My favorite paintings of Picasso are from his Cubist period, and those are the sculptures that I liked the best in this show. 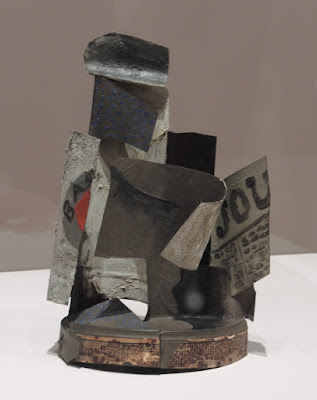 They are almost paradoxical: in Cubism the world was reduced to flat planes, with sculpture it is being made into tangible volumes again, though of an abstracted nature. Glass, 1914; painted tine plate, nails, and wood. Glass of Absinthe, 1914; painted bronze with absinthe spoon. ....while others had more complex form. The materials involved––and Picasso explored many––helped to determine the form. 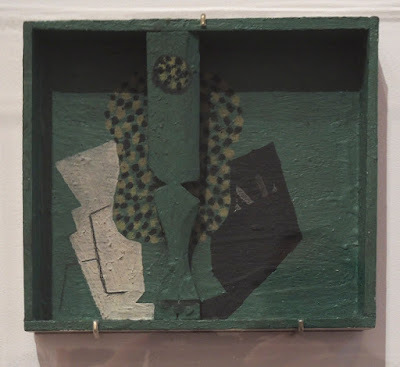 Glass and Newspaper, 1914; painted wood, pencil, and oil on wood panel. The almost flat painted wooden box is closer to the paintings, but the added form of the glass brings some whimsy to the composition. 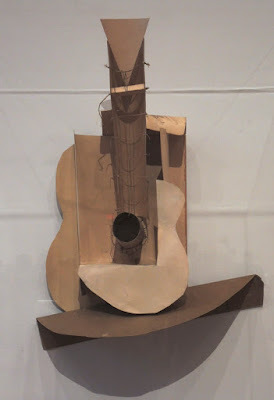 Still life with Guitar, variant state, 1913; paperboard, paper, thread, string, twine, and coated wire. Violin, c.1915; painted sheet metal and iron wire. 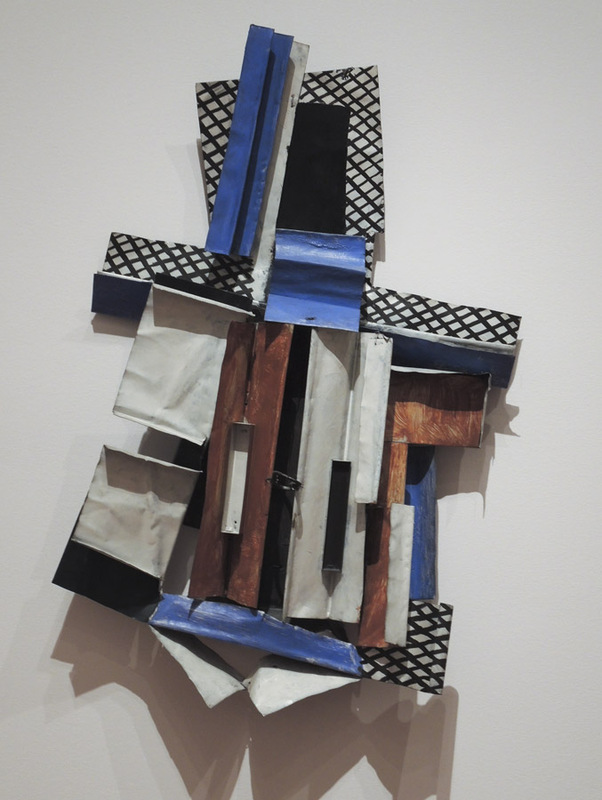 ....and this violin, though it's difficult to discern the violin amid the colorful, almost riotous planes. Head of a Woman, 1931; plaster. There were a few other pieces in this show that engaged me, such as these two images of women in plaster. The first, though more naturalistic, has the forms of the face simplified and dramatized. This drama is heightened in this second, a large head. 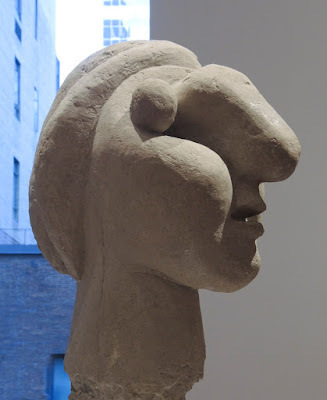 Though nothing like a real person, the actuality of the shapes, their clarity and assuredness and inventiveness, make this head remarkably alive. Engraved ceramic fragments, pebbles, bone, 1945-47. 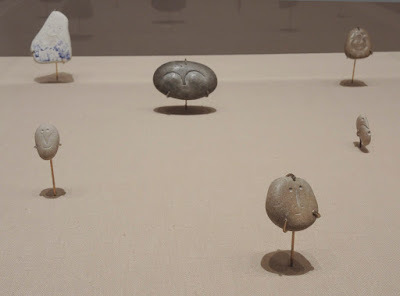 There was much in this show that was charming and delightful (maybe a little too much for my taste) and these tiny engraved pieces were my favorite of that type; perhaps it was because they were so small, so unassuming. 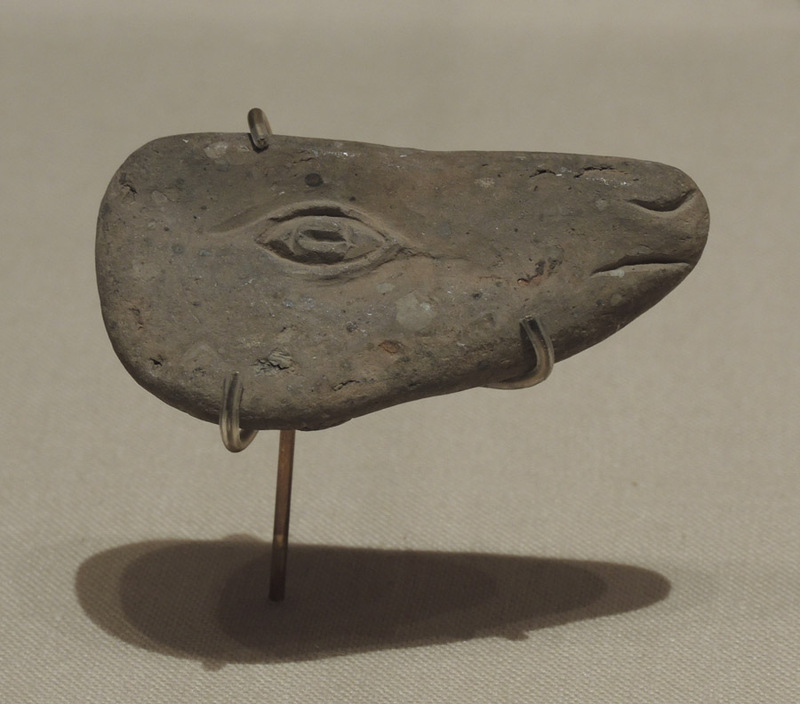 It was also because they referred to ancient art, and the forms that are simplified yet so sensitive to observation. Flowers in a Vase, 1951-53; painted plaster, terracotta, and iron. 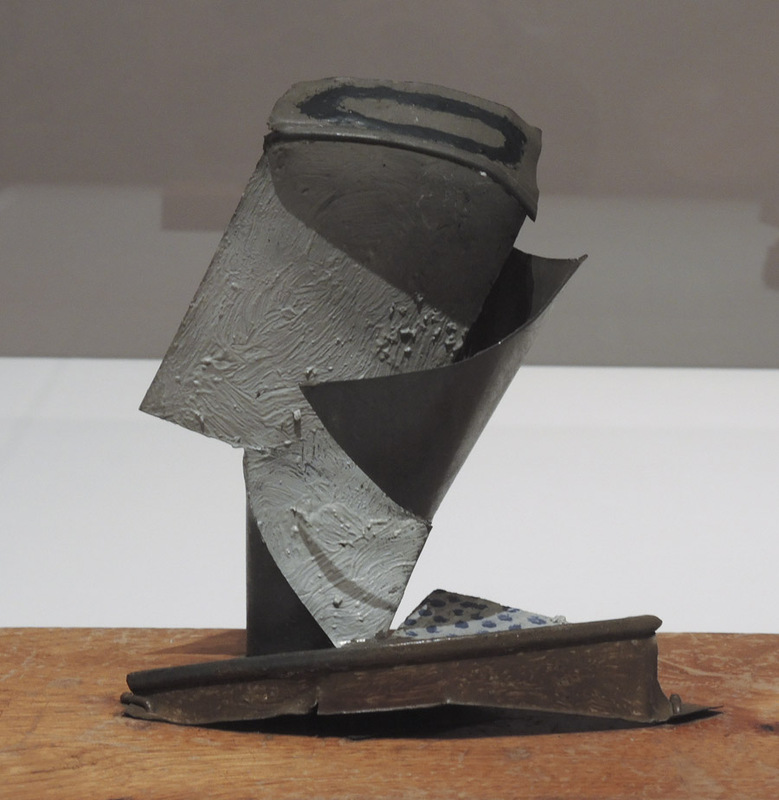 This is one of Picasso's "cute" sculptures that I enjoyed, perhaps because I'm a gardener. He really did seem to be getting a kick out of making things: fun things, silly things, sometimes more serious things. 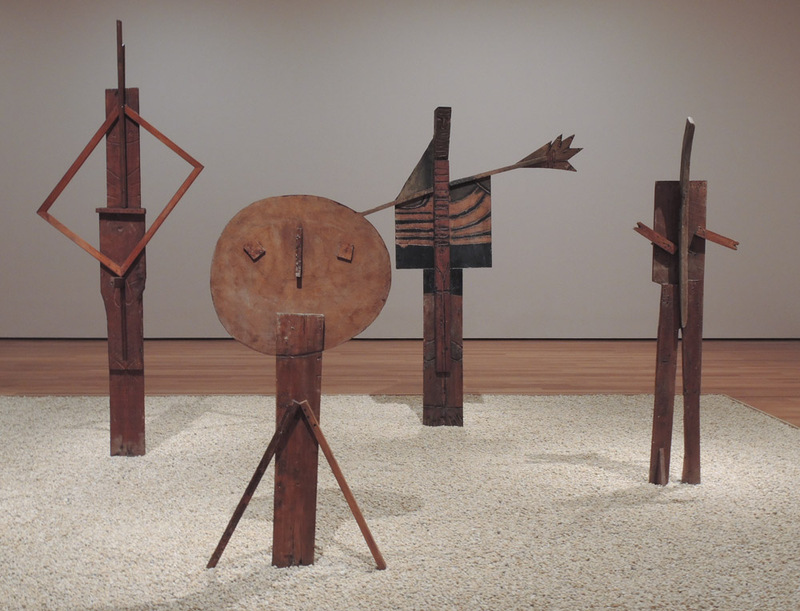 Lastly, some wood assemblages of figures at the beach; the one in the foreground is a child. 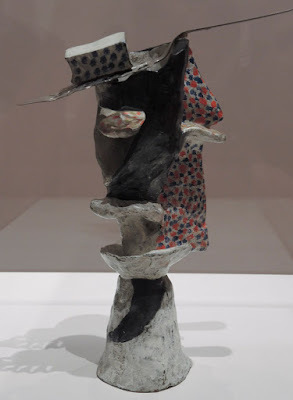 This exhibition confirms yet again Picasso's remarkable inventiveness––and who else would think of combining a bicycle seat and handlebars into the image of a bull's head?––his constant exploration, his joy in making art.